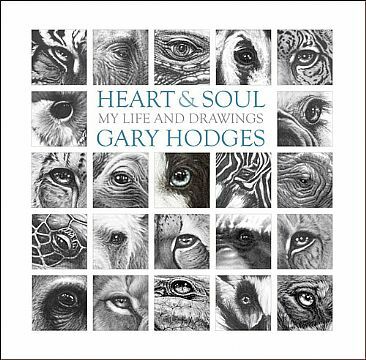 Gary Hodges - Specialising exclusively in graphite pencil drawings. Welcome to my art. I hope you enjoy looking at my drawings and celebrating nature as I do. I can't imagine drawing animals without giving something back and I'm proud that since 1987 my art has contributed well over $1,000,000 to wildlife conservation and animal welfare charities. In April 2016 I held my major charity exhibition Heart & Soul in central London. I am thrilled to have raised almost a quarter of a million dollars for my two favourite charities through the sales of my drawings and prints. The Born Free Foundation and the Environmental Investigation Agency (EIA) will use these funds to protect elephants and other wildlife. Drawings of wildlife with interviews, poems and insight to Gary. of Gary Hodges and is protected by international copyright laws. Use of nature art, wildlife art or any other images or text from this site, requires permission in writing from Gary Hodges (Gary Hodges Wildlife Art). This site is part of the Artists for Conservation (AFC) Web site. (Wildlife Art - Nature Art - Conservation) Artists for Conservation is an international, non-profit organization dedicated to nature art, wildlife art and conservation. On this site you will find world-class nature art and wildlife art by today's leading nature artists & wildlife artists. The AFC site is the Web's premier location for nature art, wildlife artists All content appearing in pages featuring Gary Hodges is the sole responsibility of Gary Hodges. The opinions expressed on these artists' pages are those of Gary Hodges and do not necessarily reflect those of the Artists for Conservation Foundationi (AFC).